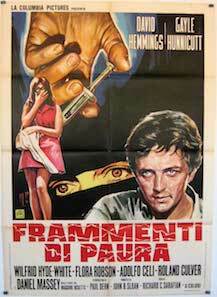 The actor David Hemmings appeared in his fair share of obscure films. For every iconic movie such as Antonioni’s Blow Up (1966), there are countless lesser known gems such as The System (1964 and co-starring Oliver Reed), Eye of the Devil (1966 with David Niven) and The Long Day’s Dying (1968 with Tom Bell). Together with his wife Gayle Hunnicutt he appeared in the psychological thriller Fragment of Fear (1970), a film I’m sure I have on VHS although I’m unable to find it. A shame, because it’s now very rare and almost impossible to track down, and it’s worth the price of admission alone for the supporting cast which includes Arthur Lowe and Wilfred Hyde-White. Hemmings and Hunnicutt also made Voices in 1973, a supernatural offering sometimes known as Nightmare. 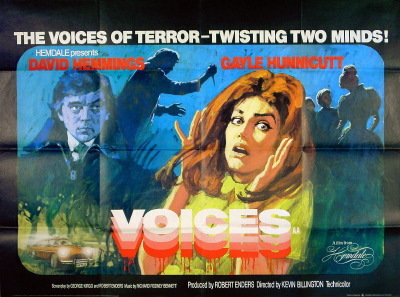 I remember seeing Voices when it was shown as part of the afternoon television schedule in the early 1980s, and it proved an odd choice for daytime tv – especially to an impressionable teenager – as the film is very much in the late night chiller flavour. It’s a very creepy affair that I’ve eventually now caught up with after all those years. Voices has some similarities with the more famous Don’t Look Now from the same year. And whilst Nicolas Roeg’s film is ultimately superior, Voices (directed by Kevin Billington) is still a minor classic in its own right. The theme of the film, which concerns a couple grieving for their drowned child who make an attempt to revive their troubled marriage, also has echoes in Lars von Trier’s recent Antichrist. More interestingly, however, The Others – the 1999 film starring Nicole Kidman – completely lifts the ghost story element of Voices, going as far as to steal some of the visual flair of the film and even the final denouement. Online reviews I’ve found also liken elements of Voices to The Sixth Sense, proving that’s there’s perhaps nothing original in a successful horror film. The film begins very effectively, with a mostly silent opening (again a similarity to Don’t Look Now) where tragedy strikes on a boating holiday (and like Antichrist, it’s revealed that a child is put in grave danger due to parental neglect). The parents in question, Hemmings and Hunnicutt as Robert and Claire, are next seen driving through dense fog, attempting to find the remote house that belongs to Claire’s mother. Where they’ll attempt a reconciliation of sorts; flashback scenes reveal that Claire has attempted suicide and spent some time in hospital. Ploughing on blindly through the fog, Robert narrowly avoids a head on collision although they eventually locate the path to the house. Based on a stage play by Richard Lortz, Voices does at times show its theatrical roots, although this plays to its advantage and creates a very close and claustrophobic atmosphere. It’s a two-hander between Hemmings and Hunnicutt throughout, and the sinister edge to the film is added by Claire’s gradual realisation of the mysterious others present in the house. If the film appears slow at times, it’s certainly worth sticking with for the last half hour where the supernatural element plays out. And even if this film is almost 40 years old, I feel I shouldn’t reveal the shock ending. David Hemmings had a dual career as a director, and was behind the odd but interesting The Survivor (1981) with Robert Powell and the ghastly Schöner Gigolo, armer Gigolo (1978) with David Bowie. However he is possibly best known, indirectly, for directing episodes of Magnum P.I. and The A-Team which are these days sadly more likely to grace the daytime schedules than Voices.